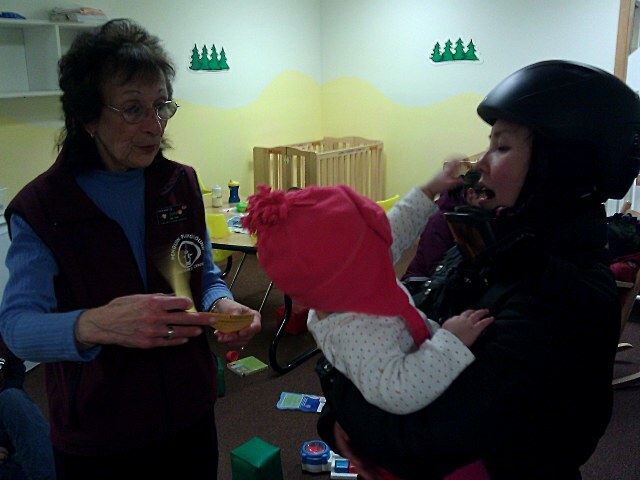 As part of our trip to Okemo Mountain with baby we decided to put Arya into daycare for one day while Mommy and I skied together. Packing for baby’s first day of daycare ended up being far more stressful than the entire day of daycare itself. Arya and her parents all survived her first time in daycare without incident. Okemo — in a bid to capture the family skiing market — conveniently located the “Penguin Playground Daycare Center” a few hundred feet from the base of the main lift. The daycare center opened from 8am to 4:30pm on weekends so we made sure to arrive at the mountain before 7:30 to secure a good parking spot close to the facilities. With our skis, poles, helmets, goggles, gloves, scarves, two baby bags, and Arya, it would have been impossible to carry everything in one trip. 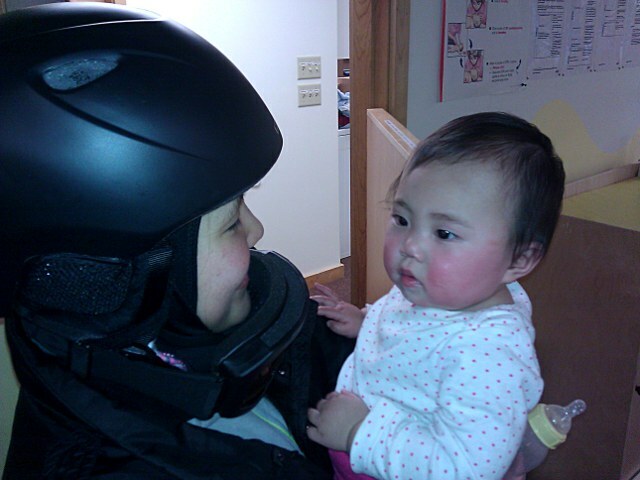 We were also a little hesitant to carry a baby (even with our infant carrier) wearing ski boots and walking on the slick ground. As a result we specifically planned one trip to take Arya and her belongings to daycare and follow-up trips to get our ski equipment. We actually arrived at the daycare center before it opened so I had time to return to the car while Mommy filled out paperwork. Our plan of multiple trips made it far easier to get everything organized and get Arya safely to daycare. Arriving early was key as we were able to secure a great parking stall a short walk from the entrance to the resort. Upon check-in at the Penguin Playground we were given a numbered pass on a colored lanyard to be used to pick-up Arya later. I forgot to ask about the process, but I would have been concerned if the lanyard would have been sufficient for any random person to pick-up our baby without further authorization from either of us. The center itself was secure with several doors leading from the exterior of the building to the main daycare entrance, a further main door into the daycare center, and an additional swinging gate between all the children and the foyer of the center. Arya was placed in the youngest group of babies ranging from 10-months to 18-months. I was surprised to see that she was the youngest baby since the Okemo daycare accepts infants as young as 6-months old. With an advertised 4:1 baby:provider ratio and multiple adults in the separate baby play room I was confident about the ability of the center to keep her safe. Since we paid for a full day of daycare, lunch was included. We did have to provide all of Arya’s milk and additional snacks as well as diapers and changes of clothes. The daycare center seemed reasonably organized with different age groups clustered into different rooms and overlapping coverage from multiple adults within each age range. The baby room was stocked with books and toys although many items were placed on shelves too high for Arya to reach on her own. Each child had a cubbyhole with a specific number. The number, two for Arya, was also attached to our lanyard, taped to every baby’s back, and stuck onto each of our baby bags. The number system seemed to work well enough to keep everyone’s items separated, but we were still glad to have labeled each of Arya’s items due to the sheer number of babies, bags, toys, and clothes spread out throughout the room. Mommy and I were both concerned about the napping situation as the center relied on a series of small cribs organized against the wall. Given our baby’s struggle to take naps we suggested the provider simply let Arya nap if she was tired and not try to force her to sleep otherwise. As it turns out our baby slept for less than 20 minutes over the course of the entire day in daycare. She did manage to finish all her bottles of milk, most of her snacks, and some of her lunch as well. Arya seemed relieved to see us when returned to pick her up after our day of skiing. Although she didn’t look like she had cried too much during the day, we could immediately tell that she was exhausted. She clung to Mommy tightly as I organized her belongings and she was fast asleep by the time we got back to the car.